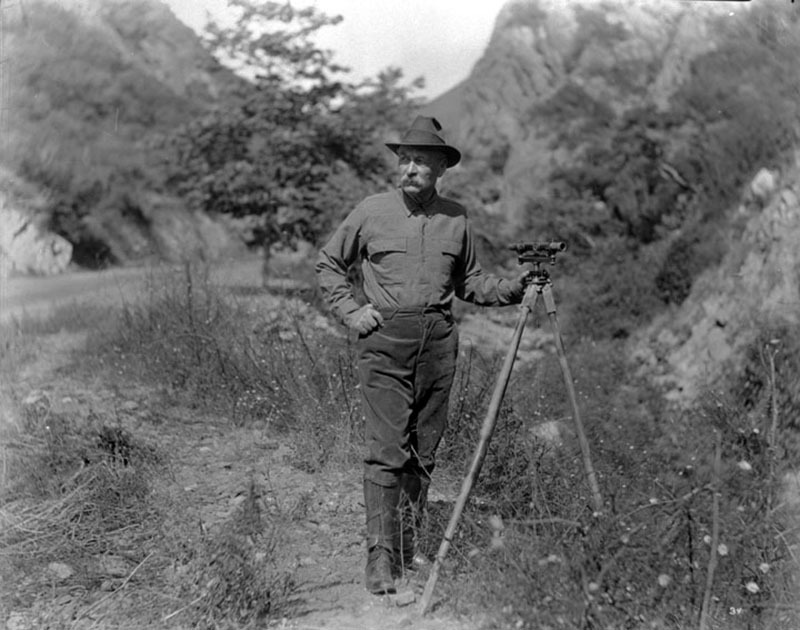 "William Mulholland, the chief engineer for building of the Los Angeles Aqueduct, taken in the field, showing him with the surveying instrument whose use he knew so well." It can be fairly said that William Mulholland engineered the growth of Los Angeles, for he brought to it the one commodity this dusty, thirsty pueblo would need to support the influx of millions of new residents — water. Chief engineer for the city of Los Angeles Department of Water and Power, Mulholland was a key player in the construction of the Panama Canal, the Colorado Aqueduct, Hoover Dam and the Los Angeles Aqueduct — the latter taking water from the farmland of the Owens Valley and piping it to the growing metropolis. As part of the project, Mulholland designed and oversaw construction of the St. Francis Dam, a 600-foot-long, 185-foot-high curved, concrete gravity dam capable of holding 38,000 acre-feet (12.5 billion gallons) of water high above Saugus in San Francisquito Canyon. The reservoir would meet the needs of Los Angeles for about a year, should the Owens Valley farmers, who often sabotaged the project — or the Elizabeth Tunnel, which crossed the San Andreas fault to the north of the dam and "Powerhouse No. 1" — threaten the flow of water to the City. Dam construction started in August 1924; water began to fill the reservoir on March 1, 1926. Two months later the dam was completed. Mulholland's empire came crashing down at three minutes before midnight on March 12, 1928. Half of the dam suddenly collapsed. An immense wall of water rushed down the canyon at 18 miles per hour, totally decimating the concete-and-steel "Powerhouse No. 2" pumping station as well as the Frank LeBrun Ranch, the Harry Carey Ranch and Trading Post, and everything else that stood in the way. Floodwaters met the Santa Clara River at Castaic Junction and headed west toward the Pacific Ocean. The communities of Piru, Fillmore, Santa Paula, Saticoy and much of Ventura lay in waste by the time the water, mud and debris completed a 54-mile journey to the ocean at 5:25 a.m. on March 13th. At dawn's early light, an estimated 431 people lay dead (Stansell 2014). Some bodies were buried under several feet of earth and were still being discovered in the 1950s. In fact, remains believed to belong to a dam victim were found in 1994. Contributing factors may have been the base of the dam, which may not have been as thick as thought, and the top of the dam, where 15 feet of concrete were added that apparently were not in the engineering plans. The disaster that ended the career of the famous engineer was the second-worst in California history, behind only the great San Francisco earthquake and fire of 1906 in terms of lives lost. LA2041: 9600 dpi jpeg from smaller jpeg | Los Angeles Public Library: LADWP Collection: Bledsoe Collection 1908-1933: Cat. No. 1000650 | Online image only.